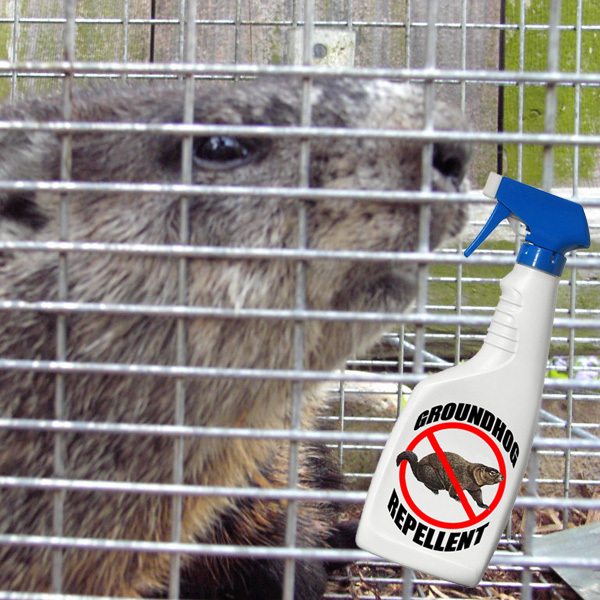 ﻿ Groundhog Repellent - What deterrent works? Groundhog Repellent - What deterrent works? Groundhog Repellent - Repellents are a type of product or substance that is said to repel a particular animal without ever coming into physical contact with the animal, which makes it an attractive option for anyone who is struggling with a particular animal problems. After a few weeks of seeing your garden or lawn become pitted and uneven with the tunnels and burrows of a groundhog, you will often be tempted to try and use these kind of measures to deal with groundhogs, although their results are mixed at best. There are several different types of groundhog repellents that you can purchase, along with products found around the home that are also said to drive these animals away, but in most cases you will find repellents won't solve the problem. One of the items that you will find in hardware stores and gardening stores to deal with groundhogs is the range of audio repellents that are said to drive these animals away from your yard or garden. The way these devices claim to work is that they emit a sound that is outside of the human hearing range, but that is within the hearing range of animals, and this sound is said to be very irritating so that it will drive the animals away from the area. The reality is that while groundhogs may find the noise uncomfortable, if they have already dug a burrow and have access to food sources in the yard or garden, a noisy neighbor such as this device is unlikely to be successful in driving the animals away. There are a range of different products that are said to have a repellent effect on the groundhog, and one of the most common is a pepper spray that is made by grinding hot chili peppers and combining them with water to create a solution that can be sprayed around the garden. Another suggestion that is often used is to push mothballs into the holes of the groundhogs, although this approach can be a little more dangerous as the groundhog is an animal that does tend to protect its territory quite fiercely. While there is little evidence to suggest these repellents are going to be successful, if you have the items around the house then there is nothing lost if you do try to use them to drive away the groundhogs. If you go into a hardware store or a gardening retailer and explain that you have a groundhog problem, you will usually be sent to the section where they have different repellent, and alongside the audio products you'll usually find chemical repellents too. Groundhogs are often grouped in with rabbit with these products, either with a product that claims to repel both species, or even more broadly under the critter repellent category. These products can often have a strong chemical scent and have substances like ammonia or mothballs as a base, while other repellents will have a strong peppermint scent, which is also said to drive away problem animals such as groundhogs. Why Don't Repellents Get Rid Of Groundhogs? In order to be truly successful, a groundhog repellent needs to make the animal either feel uncomfortable or frightened enough to leave an area where they are perfectly happy. As groundhogs are natural fighters when it comes to the 'fight or flight' instinct, the repellent needs to make them really uncomfortable, and for the majority of these animals the attractions of staying in the same location will often be quite significant. This means that they will often tolerate the repellent because the benefits to them of staying in that location are greater than the discomfort. When it comes to getting rid of groundhogs that are causing problems in your yard or garden, then trapping and removal is usually the best option. There are lethal traps available which can be installed over the entry hole to the burrow, but cage traps are more humane and mean you can avoid actually having to deal with a carcass. Wash the trap to remove any human scent, bait it with fruit or vegetables and then place the trap a short distance from the entry point to the groundhog's burrow. Once caught, take the animal in the cage trap at least ten miles from your property, and release in an area well away from other homes and gardens. The key to keeping groundhogs out of your yard or garden is to install a good solid wire mesh fence that is embedded at least six inches into the earth around your yard or garden, and making sure this is kept in good condition. You can try to remove features such as trees or other items to gnaw on, and remove the food sources from the area that the groundhog will eat, but this isn't as effective a solution as a good fence is when dealing with these animals. Go back to the main Groundhog Removal page for more information about groundhog repellent such as bleach, ammonia, mothballs. Can you buy something at Home Depot to repel groundhog?